I am a lover of books in all mediums and I want to be a wealthy, famous, published author (like you do, I presume dear reader!) so it serves me to be aware of the traditional publishing process as well as new technologies. 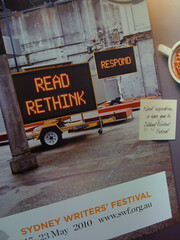 I went along to this session at Sydney Writer's Festival to see what publishers are thinking at a time of great change. It seems that Australian publishing is well behind the US and indie publishing, but it was still interesting to peek behind the curtain. Here is what I learnt from Hazel Flynn, who spent years as a publishing professional in Australia, but it would be expected that the process is similar overseas. First, you need to get the attention of an agent or a publisher. The slush pile is a bad idea as it may be months or even years before your submission gets read, if at all. It is better to have some kind of relationship with that person so your submission is even looked at. Being recommended by an agent is a good way to do this. You need to completely follow submission guidelines. Do exactly what the website of the publisher/agent asks for. Any deviation will get you chucked out immediately. Your first 2 pages must sizzle as they won't read further than that. Seriously. That's important. It's good to have a 1 sentence, 1 paragraph and 2 paragraph pitch. Check Nathan Bransford's post for more info. Brevity is key so focus. If a publisher likes you, they need to champion you at the Acquisitions meeting. For this they need to do a P&L, a profit and loss statement for your book. They also need to do a Publishing proposal. At that meeting, all the books are weighed up against each other and all the different teams get a say e.g. sales and marketing as well as publishers. The publishing proposal contains the P&L as well as synopsis, target audience and target retailers, sales history of the author and sales of comparable titles, author bio and media experience as well as marketing and publicity ideas. Plus author commitment to direct sales and any other pertinent information that would help the author's chances against other books. Publishing is a business. You as an author are a business. You need to realise that if you are serious about writing for a living. We briefly moved onto self publishing as an option and Hazel kindly called on me to speak about print on demand and digital publishing. It seemed to get people pretty excited when I told them about print on demand, Createspace, Kindle publishing on Amazon DTP, Smashwords and also Blurb for photobooks. This was a pretty funny way to end a workshop on the traditional publishing process but it does indicate how interested people are in DIY options. I was also considering The Creative Penn, which I take very seriously as a business in its own right. When I look at my own profit and loss, it is very different to a big publishers. I make income from print book sales and ebook sales, but also from other digital products like online courses as well as speaking and consulting. In terms of my costs, I have tiny overheads as I work from home, my internet hosting and shopping cart come to around $25 per month and I use print on demand for my publishing so I have no printing costs. My time could be considered opportunity cost as I can make more as an IT contractor. But most of the money I make is profit from sales with a low cost base. This is why independent publishers and authors can now make more money than big publishers selling their books online. You don't need to sell hundreds of thousands of books to make a decent income as costs are so low. I would still like to get a publishing deal for the kudos and validation it would give me, but I don't know if it will make me more money. Basically, Konrath is making more money from self-publishing books on the Kindle than he is from traditional publishing. With the rise and rise of ebooks, it is likely more ‘mainstream' authors will continue down this route. In conclusion, it was interesting to hear about how publishing works, but I just can't see it as a sustainable business model for anybody. Things are changing slowly in Australia, which is why I will be looking for a publisher in US or UK when my novel is ready! What do you think about the traditional publishing process right now? What do you want for your book? It’s perhaps time for the model to change to Freemium in some cases – certainly for non-fiction. The revenues I derive from non-book sales directly from the fact the books are out there dwarf the royalty payments. That’s so funny Tom. When I was in the workshop, I suggested the model of authors taking nothing upfront and sharing revenue and it was like I had said some very dirty words! “new models” – shock horror! I also think you are right about freemium, but perhaps it works better for us as small businesses with few overheads (post to come on this soon!) Thanks. I apologize in advance for nit-picking. Usually I restrain myself. I have learned to grit my teeth and hold my tongue when I see the increasingly common phrase “the media is…”. But when a professional writer uses the formulation “I am a lover of books in all mediums” I can’t hold it in any longer. Unless I was seriously miseducated, “medium” is a singular noun of which “media” is the plural. Nothing personal – I continue to enjoy the blog. a) I am not a professional writer as in I don’t make an income from my writing (yet!) . I have bought a grammar book though so hope to improve! b) I don’t have an editor for this blog and I post on a fast schedule in my spare time, so please forgive the occasional slip. I don’t re-read massively as I blog in the evenings and weekends, as well as trying to write WIP. Enough excuses… but I expect to hire an editor for my novel so that should avoid “professional” mistakes. Thanks for your comment and glad you enjoy the blog! PS. I know I also oscillate between US and UK spelling. I am British but most readers are US based – apologies for that as well. I enjoyed reading your article about traditional publishing versus the upcoming trend of e-books. Check out my Civil War cooking blog at: civilwarcooking.blogspot.com. Hmm. While I agree that the traditional publishing business model has its flaws, self publishing isn’t always the best way to go…for the readers that are going to buy the books in question. So far, most of the self published fiction books I’ve read are sub par at best, perpetuating the flawed perception that everyone’s a writer. At least there’s some sort of filter with traditional publishing, even though bad stuff like Stephanie Meyer still manage to filter through and go on to become multimillion dollar enterprises. Still trying to get my head around that. I don’t know. I agree that something needs to change in traditional publishing, but am not sure PoD should be considered a viable option. First off, great blog ! 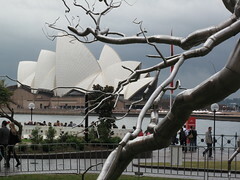 I’ve been reading many of your entries and I am enjoying many of the links to other useful sites and articles. Thanks for all of the effort and time to make it happen. I’m just starting in the business and looking forward to publishing one day. When I think about it though, I try to think of myself as a consumer first, then a writer. I agree somewhat with the above comment that many self-published works out there are pretty poor but unfortunately, when you have a non-regulated, DIY industry out there, anyone can get in the game. The print publishing business kept standards high and the ones who hate it, usually were the ones who couldn’t get published. I hope more viable options are available for writers like myself when the time comes to be published. If the industry can change and still provide a forum for quality work (like big house publishers do today) then I will have confidence in the change. Last thing I want to do is to cruise Amazon.com and buy a potentially good book, only to learn after the download that some guy obviously published it by himself without even consulting an editor. I agree paper is getting old but I think the standard of quality has to be preserved. As far as the Stephanie Myers opinion goes, I decided to buy Twilight to see just how horrible it is. My preferred authors are people like Dan Brown, Steve Berry etc. After reading the book, I did not feel that Meyer was that bad of a writer. I would like to know, in particular, why people think her work stinks? A lot of it is jealousy, I feel. People look at the beat up manuscript on their desk and the Masters Degree in Literature on their wall and wonder how a first timer can hit it big. The answer is simple, it’s because her subject matter, characters etc. were marketable. People can sit high on their work all day and feel they have the right to down someone else’s endeavor but the bottom line is they’ll stay broke doing it. Thanks again for all of the work on the site !